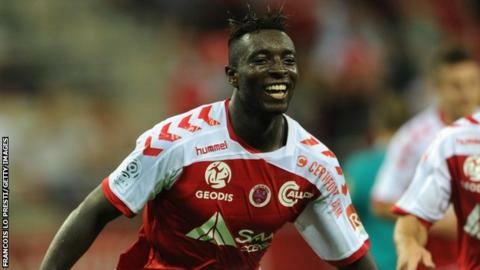 France Under 21 striker Grejohn Kyei says he would consider playing for Ghana at senior international level - if the West African country came calling. The 20-year-old, who plays his club football in France for Reims, is eligible to play for the Black Stars because his parents are Ghanaians. Under Fifa rules he is free to switch because he has not yet played for a country's senior national team. And, despite scoring on his debut for the French U-21 side, Kyei has not ruled out representing Ghana in the future. "I was born in France but my parents are from Ghana, meaning I could only pledge my allegiance to one country," Kyei told BBC Sport. Kyei revealed that his only trip to his parents' country was more than a decade ago but he follows the progress of the four-time African champions on the Internet. "I know everything in France because I was born here, but no one [from the Ghana Football Association] has contacted me," said Kyei. "But in the future, if Ghana do call me then I have to look at that international option, because you can't close doors. "I know for sure that my parents will be excited if it happens, right now I can only give my best to what is in front of me [France and Reims]." But for the moment, Kyei who has scored two league goals and racked up three assists this season, is focusing on establishing himself with Reims. "My focus right now is only on club football as I continue to work on establishing myself at Reims. "It's been a stop-start season for me to say the least, but a successful run with my club will make a strong case for me," Kyei added. Kyei began his football career at Reims by playing for the U-15, U-16 and U-17 categories. He shone in the U19 team and the reserve side which earned him a professional contract in April 2014. His first league goal came against champions Paris St Germain on the last day of the 2014/15 season.